Being second only in size to the Blue whale the Fin whale made an obvious high yield target for the whaling community. The Fin whale is probably the most hunted species of whale. The IUCN still record it as endangered and although still protected by the moratorium catch limit of zero, it is still a highly prized "scientific research" catch. It's huge size easily dwarfs the whaling nations regular take of Minke whales meaning that the capture of one Fin whale would provide meat equivalent to seven Minke whales. With such a catch the seasons quota for whale meat can be harvested quickly and more efficiently. The Fin whale can be identified by its unusual asymmetric colouring around its jaw. On the fight hand side the jaw is mostly white, whilst the left is light blue. 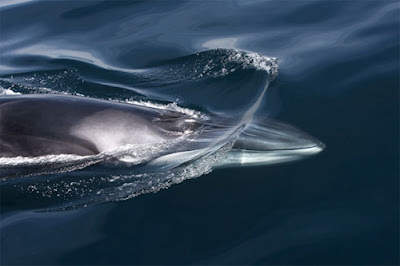 The Fin whale is the fastest of all the baleen whales and can dive deeper than any other whale species. Swimming at up to 30 miles per hour and diving to 1800 feet in hunt of fish and squid. Fin whales feed on a variety of planktonic animals as well as crustaceans, squid and fish.